Have India's tribal leaders failed their people? India has the largest tribal population in the world. But they are also the most marginalised section of society. What is it in India's political system that prevents the tribal voice from being heard? India has the largest tribal population in the world. Tribals number 8.6 per cent of its total population. They are also among the country's most marginalised. Why has India's political democracy not given its tribals their due? What is in India's political system that prevents the tribal voice from being heard? Or have tribal representatives in the high echelons of India's politicaldom failed their constituencies? What exactly is wrong? For one, the post-independence Indian state treats tribals with the same condescension as its colonial predecessors. The ethnographer-colonial official saw the tribal as the Noble Savage in urgent need of benign protection and development. Experts on tribal affairs say the Constituent Assembly -- set up to frame independent India's constitution -- didn't question the validity of tribal areas being marked out as excluded areas under colonial rule. This was the colonial legacy of "special development package" for tribals. Overall, there was agreement in the Constituent Assembly that special measures were required for so-called backward tribes. These included reservation of seats in Parliament and state legislatures, educational institutions and services. In the current Lok Sabha, 41 out of 543 elected seats are reserved for Scheduled Tribes. Over the years the Indian state has been steadfast in its belief that its development agenda would "improve" the conditions of India's tribals (see time line: Take and not give). Ironically, tribal leaders have become willing partakers of this agenda. Secondly, tribal leaders have also become prisoners to that great bane of Indian democracy -- identity politics. They find it convenient to mobilise their communities for electoral gains. Once they find a place in the political system, their cultural bond with their community is soon overtaken by an increasing misrecognition of what tribals want. It becomes a trite repetition of the state's so-called development agenda. Says Babulal Marandi former chief minister of Jharkhand and himself a tribal, "Tribals say no to developmental activities because they haven't seen the fruits of development. Maximum displacement happened only when tribals spurned jobs and employment. That's why non-tribals got all the jobs. "Mansukhbhai Vasava, Bharatiya Janata Party (BJP) Member of Parliament (MP) from Bharuch in Gujarat adds, "I want tribal areas to be as developed as cities." Tribal leaders have very little significance in mainstream political parties. Says Arvind Netam, a prominent tribal leader of the Congress party, "Tribal leaders within political parties depend entirely on non-tribal leaders. There are no tribal heavyweights in the higher echelons of the parties to influence, say, the distribution of tickets to promote a promising young tribal politician. "Of the record many tribal leaders will tell you that it is impossible to represent tribal interests within the fold of political parties. "India's electoral system is all about getting funds for the parties. The money for the elections come from the corporations, the interests of whom run contrary to tribals," explains a prominent tribal leader. Most tribal leaders also acknowledge that political survival depends on non-tribals. "The non-tribals are more regular voters in my constituency. I can't protect tribal interests when they run counter to non-tribal interests," says a Jharkhand leader. In recent times, the BJP, which calls the tribals vanvasi (forest dwellers) instead of adivasi (aboriginal dweller), is agressively subverting tribal culture by bringing tribals into the so-called Hindu mainstream. The country is eagerly awaiting the report of the Bhuria commission -- the second commission since independence (after the Dhebbar Commission of 1960)to comprehensively review administration in tribal areas. Critics of the Bhuria commission point out that the commission is composed of either leaders associated with the BJP or retired bureaucrats. So it is not above suspicion. The area where tribals live are rich in forests and mineral resources. And laws of the Indian state have made the tribals encroachers in their own land. The Forest Conservation Act (FCA)of 1980 brought forest into the concurrent list from the state list. This meant that non-forest use of forestland had to be approved by the Union government. This has been implemented without due settlement of tribal rights. FCA put an end to shifting cultivation on government forest. In several parts of India, lands that had been under shifting cultivation for generations had been wrongly notified as forestland during colonial rule. These communities did not know settled agriculture. FCA made it almost impossible for these communities to gain title rights over this land. In 1990, joint forest management was introduced to involve communities in forests. But the forest department controls the forest protection committees in villages. The government forest conservation policy ignores the fact that forests managed solely by tribals in Orissa and the Northeast are in far better shape than those managed by the state. Kunwar Singh Jonko, 34, belongs to the Ho people, a Scheduled Tribe. His village Katamba is deep inside the forest, 60-odd km west of Chaibasa, the headquarters of East Singhbhum district of Jharkhand. In the Forest Department (FD) register, his house, his fields and the entire Katamba village is an encroachment on government-owned forestland. But he has his own story. He was about 10 years old and it was around 1980. But he remembers when his family moved from near the town of Chakradharpur to Katamba. It was a forest then, and his family and relations cut it down to make it arable. They had come on the invitation of their relative, Dangor Angaria of Sangarjatta village, three kilometres away from Katamba. Angaria had learned from his elders how their ancestors had been driven out of Katamba around 1890, when reserved forest was notified in the region (see box: Origins of injustice). How did they determine in the dense forest where Katamba was situated more than 80 years ago? The tombstones of their ancestors, called sasandri, lay there. For the Ho tribe, a sasandri is the only document of land ownership. There is another mark for them: there are trees that tribals plant in their sacred groves called sarna, which is an essential feature of a tribal village here just like the sasandri. These trees are not found usually in forests typical of the area. Jonko's family was a part of the Jungle Andolan (forest campaign) that began in 1978 in what was then the undivided Singhbhum district of Bihar. Hundreds of Ho families decided to get back the land from where their ancestors had been driven out more than 80 years ago. Their way of knowing where their village stood was the same: the tombstones. The agitation intensified in mid-1978 with incidents against the forest development corporation, which had begun clear felling of mixed forest and planting teak. Several teak nurseries of the corporation were destroyed, resulting in losses of lakhs of rupees. Soon, the protest took the shape of reclaiming ancestral lands. Several political leaders emerged from this andolan, including Devendra Majhi and Shailendra Mahato of the Singhbhum Jungle Mazdoor Union. The agitation became a part of the movement for the creation of the Jharkhand state. The government responded with police action. There were numerous incidents of police firing and killing agitating tribals. A survey by the Tribal Research and Training Centre, a civil society organisation in Chaibasa, showed that 450 tribal houses were destroyed after getting looted and burnt. 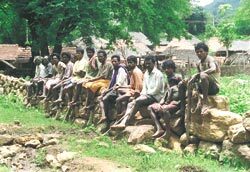 Thousands of tribals were charged with cases, very often without any reason. The chief judicial magistrate reported in 1984 that 4,160 cases were pending against about 14,000 tribals in various courts of the district. Police repression led to several cases of human rights abuse. There were reports in the media of how forest officials and timber merchants had connived to cut forests by encouraging the tribals. Once the timber was removed, the tribals were charged with felling. The cutting of forests continued. Several leaders of the andolan were arrested, including Majhi, who had emerged as the most visible leader of the andolan. Majhi contested the 1979 parliamentary bye-election from a Jharkhand Mukti Morcha (JMM) ticket, but lost to Bagun Sumbrui, the Janata Party candidate who got a lot of support from non-tribals during the elections and had opposed the andolan all along. (Sumbrai is today the speaker of the Jharkhand legislative assembly.) Soon differences cropped up between Majhi and JMM supremo Shibu Soren, and Majhi was expelled. But Majhi went on to contest the legislative assembly elections and became a member of the legislative assembly (MLA). In 1981, another organisation came to the fore of the andolan: the Kolhan Raksha Sangh (KRS). The thrust of this organisation's argument was that Kolhan was a government estate at the time of India's independence with an administrative set up based on Wilkinson's Rules. They proclaimed that Kolhan had not become independent in 1947 with the rest of India. In 1981, KRS representatives came to Delhi to argue that Kolhan was a republic and its alliance was with the British Commonwealth and the British Crown. They also sent a representation to the United Nations in Geneva. On their return, these leaders faced sedition charges. Other leaders went underground and encouraged the Jungle Andolan's spread eastwards into the famous Saranda forest. By 1984, the Jungle Andolan had cooled off. A writ petition filed in the Supreme Court by Mathew Areeparmpil, director of the Tribal Research and Training Institute, led to the court putting an end to the police terror. In 1986, the Ranchi bench of the Patna High Court, after hearing a petition by tribals regarding the taking away of their land by the FD ordered the deputy commissioner of Singhbhum to hold an enquiry into the claims of tribals on the land that was under the forest department. No action has been taken on that court order till date. The tribals who had taken back the land of their ancestors are still cultivating that land, though they complain that the forest department troubles them ceaselessly. Devendra Manjhi was killed in 1994. His wife, Joba Majhi, became a member of the Bihar legislative assembly in 1995. After Jharkhand's creation, she became minister of tourism in the Babulal Marandi cabinet. She made public statements that her condition for joining the cabinet was that the tribals who had taken back their lands should be awarded pattas (title deeds) of that land. The Marandi government fell in March 2003, and Joba Majhi joined the Arjun Munda cabinet, again as tourism minister -- again after making a lot of press statements that her condition for joining the cabinet was that the tribals listed as encroachers be given their land. Kunwar Singh Jonko, and hundreds of Ho people, keep trying to evade the legal notices they keep getting. Jonko works for an organisation called JOHAR (Jharkhandi's Organisation for Human Rights). Chandra Bhushan Deogan, an advocate associated with JOHAR, says the most frustrating part of the affair is that the forest department refuses to make public the 1890 notifications that marked the reserved forest. He says the department is doing this deliberately as the notifications can be challenged because in several areas, the procedure laid down in the Indian Forest Act of 1878 for notifying a forest has been violated. Forest department officials refuse to part with the 1890 notification. Joba Majhi, her ministerial status notwithstanding, says she hasn't been able to see the notification because of the forest department's non-cooperation. Jharkhand's minister of environment and forest, Yamuna Singh, is from the Kharwar tribe. He alleges that people who have captured forestland don't think of national interest, and that most of them are settlers from West Bengal and Orissa. In any case, he says, he can't release the land even if he wanted to, because of the forest case in the Supreme Court (Godavarman v Union of India). It is quite clear that the forest case has become a ready excuse for anybody who doesn't want to earnestly work out a solution to the precarious situation that the tribals of Sighbhum find themselves in. Political observers also say that finding a solution is not advantageous to the Jharkhand leaders as it wipes out a healthy issue to draw votes during elections. February 2, 2001, is a date etched in blood in Tapkara. It was the first major incident of violence in about three decades of protest against the proposed Koel-Karo dam in the Torpa block of Ranchi district, Jharkhand. Police opened fire on 2,000 tribal people (or 5,000, depending on the estimate you prefer to trust) who had gathered to protest at Tapkara village. Five people died on the spot and three in the hospital. Their object of ire: a proposed project to generate 710 megawatts of power by building two dams across the Koel and the Karo rivers and a connecting channel. The project was proposed in 1973, and protests began immediately by people likely to be displaced. 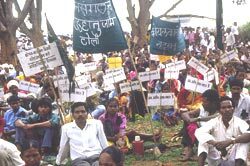 The movement against the dam became part of the larger movement for creation of a separate Jharkhand state. It is widely cited as the longest and the most successful anti-dam movement in India, rooted entirely in the highly mobilised Munda society -- a Scheduled Tribe that is indigenous to the Chhotanagpur Plateau. The movement hasn't succeeded in getting the project scrapped, though the National Hydro-Electric Power Corporation has not been able to conduct even the preliminary surveys due to the organised nature of the tribal protest against it. That the February 2001 incident happened only a few months after the creation of the Jharkhand state is gravely symbolic of the relationship of the tribals with their leadership. "We felt betrayed. This happened when a tribal, Babulal Marandi, was the chief minister," says Soma Munda of Lohajimi village in Torpa block, chairperson of the Koel-Karo Jan Sangathan (KKJS). "We don't trust any political party. Wherever a dam has come up, political parties have done the people in. We know the government is interested as long as we have the land. Once we move out, we will lose everything." He wasn't always this cynical. There was a time when every political leader trying to gain a foothold in the boiling cauldron of Jharkhand politics was willing to extend support to the protest movement. The public sentiment against the project in the Torpa area has been so strong that even Babulal Marandi, who was hardly a part of the movement for the creation of Jharkhand and still became the state's first chief minister, had declared that the dam won't come up if the people of the area don't want it. Those who supported KKJS in the past include Karia Munda of the BJP, now the Union minister of coal, and Shibu Soren of the Jharkhand Mukti Morcha, Soren group. Karia Munda no more supports the movement against the dam, points out Dayamani Barla, who lives in Ranchi and has been at the forefront of the struggle. "In fact, once we raised the issue of unemployment that led young Jharkhandi women to work as housemaids in Delhi and other places. He turned around and said that jobs would come about only when projects like Koel-Karo go ahead. We all know what jobs indigenous people get in these projects, if any at all -- those of fourth class labourers." Shibu Soren, one of the oldest leaders of the Jharkhand movement and the biggest leader of the main opposition party in the state, is also non-committal on the issue. Down To Earth asked him whether he would scrap the project if his party came to power in the state. "We will ensure that the residents benefit from the project," Soren said. Arjun Munda, Jharkhand's new 35-year-old chief minister, is a leader who came out of the All-Jharkhand Student's Union that led the Jharkhand movement from the front since the mid-1980s. Down To Earth asked him where he stood with regard to the Koel-Karo project. He declined to take a clear stand. "I will find a solution that is acceptable to all parties. I will ensure that the benefits from the project go to the people whose land is taken away, that they are adequately and justly compensated." Says Soma Munda, "Talk of rehabilitation is irrelevant. In 1987, we asked them to show us how they would resettle two villages as models for rehabilitation. The government couldn't do it. We have two essential markers of a village: the sasandiri stones under which our ancestors lie buried, and our sacred groves called sarna. How will the government relocate them?" He gives a wily smile and explains: "We knew the government cannot relocate these. So we made it a precondition." The way the leadership here has kept the government from carrying out its intent is quite remarkable. 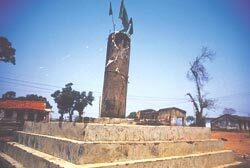 In 1985, the district police officers and an armed contingent laid siege on the village to force the government's presence in the area. 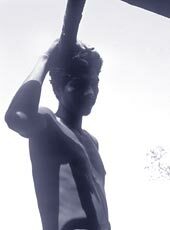 The Munda used each and every tribal custom to make life difficult for the police. The police got no firewood or water in the area, and the women started cordoning of the police camp in the morning to ensure that the policemen did not get to go out to defecate. "We told them they can't defecate on our sacred groves. Our women planted crops on their path, knowing that if they damaged the crop they would have to pay compensation. Without any violence, we made their lives so miserable that they ran away in the cover of the night." How is the tribal society of southern Ranchi district so organised? KKJS general secretary Vijay Gudia, resident of Tapkara, explains: "The people here are predominantly from the Munda tribe, and the customary system of collective decision-making is very much alive here." Anthropologists in Ranchi point out that though these systems may not be as democratic in some areas as they were in the past, they serve the need of the tribal community much better than the modern political system. The way the Munda leadership here has handled the movement is a story by itself. This leadership is extremely conscious of the long-drawn struggle for land and forest that has marked the history of the Jharkhand region. For them, the difference between the British colonial masters and the governments of independent India is very little. They are all aware of the laws to protect alienation of their land, which their ancestors (including the legendary Birsa Munda) earned after great sacrifices. The most important one is the Chhotanagpur Tenancy Act (CNTA). Passed in 1903 by the colonial government. It prevents non-tribals from purchasing tribal land in the Chhotanagpur plateau. It is worth noting that KKJS also draws support from non-tribals who have lived with them for long (they are called sadan). The traditional Munda leadership is also well connected with the larger political leadership of the Jharkhand movement. Several members of legislative assembly (MLSs) have supported the KKJS at some stage or the other. But a gap between the political leadership and the traditional tribal leadership is increasing. The last real living example of this relationship, perhaps, is Niral Enem Horo of the Jharkhand Party. Widely respected as an extremely honest politician and a true leader of his people, Horo has maintained all along that the Koel-Karo project should be scrapped. In fact he told Down to Earth that he was not happy with the present leadership of the KKJS because it was showing signs of giving in to government pressure. Fact however remains that Horo is completely sidelined in the present politics of Jharkhand -- he lost the legislative assembly elections in 2000. Those who are in power have already made noises about amending CNTA, including former chief minister Babulal Marandi, who claims that the law does not help tribals as it prevents them from getting the market price for their land. Most politicians talk about getting rid of CNTA because it blocks the 'development' of tribal areas. It is quite something to hear so many tribal leaders talk about keeping the 'national interest' in mind. Andhra Pradesh (AP) is the best place to learn how to use a tribal welfare machinery to subvert tribal interests and then use it to counter the polity at large that defends those interests. Three years ago, the state used a body mandated by the constitution -- the Tribes Advisory Council (TAC), supposed to advise the state government on issues of tribal welfare -- to push through a law aimed at facilitating transfer of land away from the tribals. The TAC was headed by the minister of tribal welfare, M Mani Kumari, and included a host of legislators (tribal and non-tribal) and officials. For its Scheduled Areas, Andhra Pradesh has a Land Transfer Regulation Act 1 of 1970. It checks the transfer of tribal land to non-tribals with due regard to the special status that the Constitution has given to tribal land. It is referred to as the "1/70" Act. In the mid-1980s, the government under N T Rama Rao tried to amend this law. The Union government used the Fifth Schedule to prevent the amendment -- the only time ever that the Centre used this provision. In mid-2000, there was a controversy over the state government's decision to amend it to allow mining of bauxite from the Chintapalle tribal area of Vishakhapatnam district, which has more than 550 million tonnes of the ore used to make aluminium. The state government had decided to amend the law after Dubal, a transnational aluminium company with its headquarters in Dubai, offered to set up an aluminium smelter near Vishakhapatnam with an investment of Rs 4,500 crore (and a captive power plant at the investment of Rs 7,500 crore). The decision to amend 1/70 was rolled back due to pressure from opposition parties and the civil society. But the episode brought to light how a state's tribal welfare machinery can be twisted to not only act against tribal interests but actively undermine the democratic processes that can defend those interests. A stark example of this co-optation was the meeting of the TAC held on May 24, 2000. The council was to decide on the advice it would give the governor on the proposed amendment to the 1/70 Act. The advocate general of the state government had recommended this course of action to avoid having to table the bill into the state's legislative assembly, which was bound to get embarrassing for the government. Instead, the government chose to put the matter in front of the TAC, get its approval, and send the amendment to the governor for presidential assent (under the special powers vested with the governor in the Fifth Schedule). The irony: the special powers were given to the governor in the Constitution to protect tribal interests, not undermine them. Several civil society groups and political parties were up in arms against the move of the government, showing how once the tribals' land is taken away, no amount of compensation can provide them security of livelihood. Back to the TAC. The council had unanimously rejected proposals to amend the 1/70 Act on two previous meetings on April 12 and May 10. It is a norm that once a proposal has been rejected by the TAC, it is not brought for reconsideration for the next six months. But within a fortnight, a visit was arranged for the TAC members to go and see how the Orissa government had set up an aluminium plant in the tribal-dominated Koraput district. The TAC was reconvened by the tribal affairs minister and asked to reconsider the amendment of 1/70 Act on May 24. The minutes of the TAC meeting make for interesting reading. Some MLAs were arguing that tribals were welcoming the move. There was mention of a conflict between tribals and non-tribals, but all this was brushed under the carpet. The dissenting MLAs mentioned the several ways in which tribals are cheated out of their land and how non-tribals exploit them. But the council approved of the amendment proposal, with the MLAs of the Congress party and the communist parties dissenting. Apart from the vociferous protest that the move evoked from the civil society and the opposition political parties, it violated the spirit of the landmark Samatha judgement of 1997. Samatha, a grassroots organisation with a wide network in Andhra, had filed the case in the Supreme Court against the state government leasing out tribal lands to private mining companies in the Scheduled Areas. The court had held that the state government is also to be considered a "person" when it came to mining leases in Scheduled Areas, and had ordered a list of safeguards to ensure that mining does not violate the rights of the tribes and that the profits from mining are shared with the tribals. Andhra government's proposal to amend the 1/70 Act in 2000 actually said that "person does not include the state government". The government clearly wanted to circumvent the safeguards ordered by the Supreme Court. So what the TAC approved under pressure was violating the spirit of the 1/70 Act, the Fifth Schedule of the Constitution, and the ruling of the Supreme Court. By August 2000, public pressure against the amendment proposal became too embarrassing for the government. The chief minister announced that the proposal was being dropped because it was becoming too controversial. Before he did so, a bigger threat had emerged: a move to amend the Fifth Schedule to circumvent the Samatha judgement. And this move came from the Union ministry of mines. On July 10, 2000, the ministry circulated a secret note to the committee of secretaries, proposing an amendment of the schedule to sidestep the Samatha judgement. The note was leaked to the media, and became a controversy by Decmber 2000. Even Babaulal Marandi, the ruling Bharatiya Janata Party's chief minister of Jharkhand, came out openly against the move. On March 15, 2001, Congress leader Arjun Singh asked in the Rajya Sabha if the Union government planned to amend the Fifth Schedule. The Prime Minister answered that the government had no intentions of amending the schedule to overcome the Samatha judgement. And the matter lay at rest. Democracy and self-rule remain elusive in tribal India. The main reason: India has no policy for its tribal people. Though the constitution acknowledged the special situation of tribal communities, it did nothing more than create some special windows of representation according to the population proportion. Result: the overall approach of the Indian State to the tribal communities has been the same as that of the colonial governments. There has never been a serious and comprehensive rethink. Take the example of the Fifth and Sixth Schedules. The Fifth, governing tribal areas in central India, mandated the creation of a TAC in every state with substantial tribal populations. Babulal Marandi, former chief minister of Jharkhand, held only one meeting of the TAC in his two-year tenure. He told Down To Earth he is a tribal and knows what is best for tribals, so he didn't feel the need for further meetings. But even if it meets, the TAC is only a consultative body with little or no powers. Andhra Pradesh has already shown how a TAC can be made totally servile and used as a weapon to counter democratic institutions that might defend tribal interests. Even the Panchayats (Extension to Scheduled Areas) Act of 1996 (PESA, applicable to Fifth Schedule areas) is fraught with contradictions. It gives significant ownership rights over natural resources to the gram sabha of a tribal village. Yet bureaucrats complain that the Act can never be really implemented. For example, the legal custodian of forest is the forest department. But PESA makes the gram sabha the owner of minor forest produce. In the first case the government passed the Act without any discussion. Secondly, powers have not been defined clearly. Jharkhand has passed its own legislation to implement PESA. But this has been widely criticised for violating the spirit of the Central act. Alex Ekka of the Indian Social Institute describes the Jharkhand act on PESA as "anti-people". He gives the example that the state's legislation does not mention that the gram sabha has to consulted before any acquisition of land for development projects. The Sixth Schedule, which applies to states in the Northeast, is a far better instrument of self-rule than its Fifth cousin. Its main feature is the creation of autonomous districts governed by Autonomous District Council (ADC), which has substantial executive, legislative and judicial powers. For example, it mentions that administration of justice should be based on codified customary law in Sixth Schedule areas. Jayant Rongpi, Scheduled Tribe member of Parliament from Karbi-Anglong in Assam, says ADCs have made no efforts to codify customary law in the state despite repeated pushes. The report of the first constitutional commission to review the working of the constitution in the Scheduled Areas, formed in 1960 under U N Dhebar, has been the basis of the tribal development programmes. In 2002, a second commission was created under Dilip Singh Bhuria, former member of Parliament who quit the Congress in 1996 to join the BJP. Ram Dayal Munda, anthropologist and an ideologue of the Jharkhand movement, says: "One major contribution this commission can make is to come out with a clear policy for the government on tribals in India." One of the issues that the commission is reviewing is the vexed issue of tribal rights to forestland. Several politicians and chief ministers have voiced the demand for amending the Forest (Conservation) Act, but their motivation is nothing beyond short-term political gain at the cost of country's ecology. As yet, politicians have little stake in solving the forestland issue -- in fact, they have a stake in keeping the conflict alive. The tribal-forest relation is hard ly understood. Savyasaachi, sociologist at the Jamia Millia Islamia University in Delhi, says very little is known about how and when tribes started seeing the forest as a living space. Would the Bhuria Commission look into historical wrongs? Or are we to have more of the condescending approach towards tribals ? The commission's report is eagerly awaited. The implications would be great for a state like Jharkhand. Academics and leaders of the Jharkhand struggle say that now its Scheduled Areas should be brought under the Sixth Schedule, which provides greater autonomy and self-rule. But the state was created in 2000 only when the BJP-controlled Union government saw that their party was likely to form the government here. Soma Munda, leader of the movement against the proposed Koel-Karo dam, has a message for Bhuria: "If he is heading such a powerful commission that will determine the future of the tribes of India, he should not forget that he is a tribal. He shouldn't betray his people."